Asphalt Shingle Improvement | Have Asphalt Shingles Improved? Asphalt shingles have been a familiar standby for more than 100 years. Over time, they've come to dominate the steep-slope roofing market, accounting for 80% to 90% of all residential roofs. Throughout most of this century, shingles didn't change much: 1965's basic product wasn't a whole lot different from 1925's. Since the mid-1970s, however, shingle makers have introduced quite a few innovations, including fiberglass reinforcing mats, self-sealing tabs, laminated construction, and modified asphalt formulas. Today, there are many types of shingles to choose from. But in the 1980s and 1990s, some of the latest "improvements" turned out to have drawbacks. 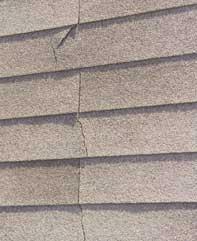 In particular, homeowners and home inspectors started to report a widespread splitting and cracking problem in fiberglass shingles. Often, shingles warranted for 20 or 30 years would fail in just three to seven years (see the photographs below), and warranty service frequently left owners dissatisfied. Eight years after The Journal of Light Construction first reported on the cracking and splitting problem ("Choosing an Asphalt Shingle: Organic vs. Fiberglass," 5/93), controversy still simmers over the problem's extent, its causes, and the solutions. 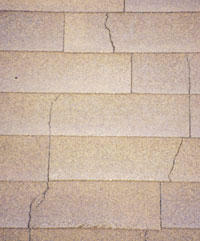 Many fiberglass shingles installed in the late 1980s and early 1990s developed cracking problems. The shingles on the left, installed in 1988, showed typical vertical cracking when inspected 11 years later, in 1999. The shingles on the right, installed in 1992, showed noticeable cracking in 1997, when they were only 5 years old. When we took a second look at shingle quality this spring, we found that the roofing industry has made strides toward answering complaints and improving its products. Successful lawsuits have spurred shingle makers to pull many low-end shingle brands, and a tightening of codes and standards seems to have improved quality throughout the industry. Home inspectors report seeing the familiar splitting and cracking problem only rarely, and roofer groups acknowledge that the phenomenon has declined. Picking a shingle still involves some guesswork, and it can still be a gamble. But if you take reasonable care in both selecting and installing shingles, the odds of getting a roof that lasts have improved. 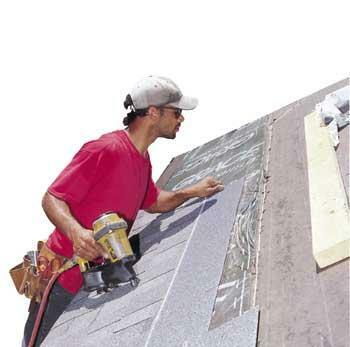 Roofing shingles are a composite product that's tricky to manufacture. Every shingle contains an inner reinforcing mat, a coating of hard asphalt modified with mineral fillers, a top surfacing of mineral granules, and a back-surface dusting of finely ground mineral dust. Each shingle also has a stripe of adhesive sealant across its center to hold shingle edges down when the wind blows. Each of these components must have the right qualities to do its special job. The strength of the reinforcing mat, the flexibility and durability of the asphalt, the thickness and coverage of the granule layer, and the holding power of the sealant all affect the way the shingles function. Shingle brands can differ in all sorts of ways, but the most critical factors seem to be the strength of the mat and the quality of the asphalt. Reinforcing mats. Two different types of mats are used in the shingle industry: non-woven fiberglass mats and organic felt mats made of wood fibers and recycled paper. The organic mats are thicker, heavier (more than 20 lb./100 sq. ft.), and a good bit stronger than the fiberglass mats, and are saturated with a soft, pliable asphalt that binds the fibers together and protects them from water. Fiberglass mats, on the other hand, weigh very little (around 2 lb./100 sq. ft.), and are bound together with a phenolic adhesive. Since they are not affected by water, fiberglass mats don't have to be saturated with asphalt. Asphalt formulas are complex, and the quality of both the soft and hard kinds is challenging for manufacturers to control. The coating asphalt needs finely ground mineral fillers to stabilize it, but the amount and type of filler have to be carefully monitored in order for the asphalt to have the right combination of flexibility, scuff resistance, and durability over time. Fiberglass shingles have come to dominate the market, for several reasons: They are lighter and easier to handle, they are more resistant to moisture, and they carry a higher fire rating than organic shingles. But organic shingles remain popular in the northern United States and in Canada. Many roofers say that organic shingles are easier to handle in cold weather, and while the hot sun in the southern U.S. can degrade their soft asphalt, they hold up well in colder climates. While both kinds of shingles can suffer performance problems, the widespread cracking and splitting problems of the 1980s and 1990s involved only fiberglass shingles, particularly the lighter-weight brands. Organic shingles suffer occasional defects that can make the shingles cup, curl, or lose granules, but they don't generally split: If the coating asphalt stiffens with age and cracks, the softer asphalt underneath tends to stay intact, and the very strong organic mat restrains the crack and stops it from progressing. In fiberglass shingles, by contrast, a split in the brittle coating asphalt can go right through the shingle, sometimes overwhelming the limited strength of the mat. Thermal shrinkage puts tension on the shingles when temperatures fall, and once a crack gets started, it tends to propagate itself as the stress concentration moves along the split. In fact, in shingles that are vulnerable to the problem, splits and cracks that start in one shingle are often seen to run from shingle to shingle over large areas of the roof. Preventing the cracking problem requires the manufacturer to pay attention to both the fiberglass mat and the asphalt. The asphalt blend has to be flexible, but not too soft, with just the right amount of filler. The mat, for its part, has to have adequate strength and be positioned near the center of the shingle so that it isn't overstressed if the shingle bends up or down. Unfortunately, it is very hard for the buyer to know anything about the asphalt or the mat in a shingle. Appearances can be deceiving: A thick, heavy shingle might have poor quality asphalt with too much filler, or it could have a very lightweight fiberglass mat; and a thin shingle that feels flimsy may in fact have good toughness and flexibility, with a well-made asphalt mix that will stand up to years of exposure. Labels and product literature do not include information about the shingle ingredients, and manufacturers typically will not disclose the details. Objective standards elusive. Since the eye is no judge, the industry has looked for objective measures. Roofer organizations have pressured the manufacturers for years to develop industry standards to ensure the quality of shingles on the market. There has been a lot of argument about the properties, types of test, and test minimums that should be required; a manufacturers task force that formed in 1993, for instance, recommended tests for tensile strength and elongation, but was never able to develop any. The same task force proposed a grading system for shingles, with labels to distinguish Grade A, Grade B, and Grade C; but companies could not agree on the terms of any such system. However, there has been progress on one industry standard, ASTM D 3462, which sets minimum weights for shingles and for their reinforcing mats, and which also includes several physical test protocols that shingles must pass to comply. D 3462 has been amended seven times since 1993  and it seems to be having some effect. The American Society for Testing and Materials (ASTM) writes voluntary standards for just about every material produced in America. Committees include representatives from all parts of the industry involved  most or all of the manufacturing companies participate, along with "general interest" members such as architects, engineers, or literally anyone who is motivated to join and attend meetings. Standards are set by consensus, not by majority vote  any member's objection to a proposed change sets off a new round of deliberations. Fiberglass-asphalt shingles fall under ASTM Standard D 3462; organic shingles are covered by ASTM Standard D 225. Before the cracking problem appeared in the late 1980s, the committee that writes and amends ASTM D 3462 was little noticed, and the standard itself was widely ignored. But when roofer groups began to voice vigorous complaints about shingle defects, the D 3462 committee became a focus of hot disputes. Different "stakeholders"  companies or other groups with an interest in the standard  have pushed different points of view in these discussions. Manufacturers who target the low-cost do-it-yourself market with "commodity-grade" shingles have argued against upgrading or enforcing it, while companies who mainly sell through big wholesalers to professional roofers have wanted the standard toughened. As a result, the standard still represents something of a compromise: Some roofers and even some manufacturers believe the minimum requirements are too low. But in recent years, new requirements have been introduced that test shingle qualities in new ways. Tear test. The standard has long included a tear-strength provision based on the Elmendorf tear tester, a pendulum device that measures the force needed to tear a shingle. To comply, shingles need an average strength of at least 1700 grams. While some companies maintain that tear testing does not identify the qualities a shingle really needs in service, other companies have joined roofers in supporting the requirement, and it remains in force. Nail pull-through. One new requirement in ASTM D 3462 is a fastener pull-through test that measures the force needed to pull a nail head through the shingle at two temperatures (around 73°F and around 32°F). CertainTeed's technical director Mike Noone, who pushed for the nail-pull requirement, is chairman of ASTM's committee for asphalt shingles. He says CertainTeed's research shows that the nail-pull test is a good measure of a shingle's overall toughness. However, Noone believes the pull-through minimums should be set higher: "At 32°F,the value is 23 pounds [of force required to pull the nail through the shingle]. I think if you aren't closer to 30 you aren't going to do very well on the roof." Pliability. Another new requirement is a pliability test that requires the shingles to handle a right-angle 1-inch radius bend without cracking. This helps to ensure that efforts to increase shingle thickness or strength don't make the products too stiff or brittle. Future enhancements. One change that has been talked about, but not yet adopted, is a test method that would put shingles through an accelerated heatconditioning process in a dark oven to simulate the effects of heat aging in the field, before subjecting the shingles to the nail-pull, tear, and pliability tests. CertainTeed's Noone says his company's research shows that this process would predict how well shingles would retain their toughness and flexibility after enduring years of sunlight. But the technology to withstand this kind of abuse involves the complex chemistry of asphalt, and not all manufacturers are eager to take the problem on.